Special guests from India presented the on-going work of the Fifteenth Finance Commission of India, notably approaches to the devolution of revenues across levels of government. This built on the discussion at the high-level roundtable earlier this year organised by the OECD Fiscal Network. Delegates were invited to comment and offer their views. Proposed reforms of fiscal relations (Brazil) and the economic impacts of fiscal equalisation programmes (Australia) were discussed, followed by delegates’ roundtable interventions. New work by the Fiscal Network examines a recent questionnaire and indicators of spending power and performance across five key sectors of sub-national government service delivery, including education. The new indicators reveal unique insights about how responsibilities are assigned across levels of government. Differences in characteristics across sectors and types of countries may have important consequences for intergovernmental fiscal relations. 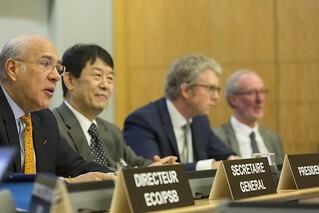 Joint work with the OECD Joint Network of Senior Budget and Health Officials is examining how central governments can ensure health services are delivered efficiently and equitably, in an often-decentralised context, where health spending and standards of delivery are influenced by central government regulation, legislation and convention. Qualitative and quantitative information on the organisation of health systems and hospitals was analysed, including how the degree of decentralisation affects cost and quality outcomes. Secretariat paper on health system and hospital performance (Luca Lorenzoni and Alberto Marino). In preparation of the 15th anniversary of the Fiscal Network, a number of retrospective and prospective studies are being undertaken. Network Chair Junghun Kim made an introduction based on his own experience with the Network. Then former IMF director Teresa Ter-Minassian gave an overview of the significance of the Network’s contributions to policymaking and knowledge of fiscal federalism. Professor Chris Heady, who was involved in the founding of the Network, discussed its origins and its contributions in the tax policy area, including in measuring fiscal autonomy. This was followed by a discussion with delegates, led by Switzerland (Werner Weber). The discussion will be continued with a look at comparing fiscal institutions, by Jonathan Coppel on the usefulness of benchmarking federal systems with the Fiscal Network. Daniel Plaatijes (South Africa) will relate the usefulness for emerging economies. Then the Secretariat (Sean Dougherty & Hansjörg Blöchlinger) will discuss new and previous work on fiscal institutions, fiscal rules and inclusive growth. Finally, Dorothée Allain-Dupré will present the forthcoming OECD Handbook on Multi-level Governance. This will be followed by a discussion with delegates, led by Austria (Philipp Päcklar). Conditional transfers are tools used by many countries for intergovernmental fiscal relations. However, the design and governance of such grants is complex and experience varies across OECD countries. Selected countries will share their experiences with grant design and implementation – including how to prevent misuse – and draw lessons for the future. Presentation David Rowe, Deputy Assistant Director for Budget, Office of Management and Budget, United States Conditional Grants: Value for Money? Targeting the Right Recipients? Panel discussion with delegates Led by both Australia (Russell Campbell) and India (N.K Singh).